Sweetwater is home of the world famous Rattlesnake Roundup held each Spring. Be sure to add that to your bucket list. Any other time Bar J is a great place to stop, kick the dust off your boots and sit a spell. Easy Access. Restrooms were easily the nicest I have seen in any park. Clean, very nicely done. Nice lobby/lounge/game room. Right on highway so a little bit of road noise but with door and windows closed & a small electric heater running (was about 35 degrees overnight when we stayed!) road noise was no longer noticeable. Not particularly scenic, but a great place to pull off highway for an overnight on a longer trip. The park was very clean and staff was very attentive. Some reviews say it's excessively noisy due to proximity to IH 20 and Love's Travel Stop. I didn't notice traffic noises at all. Site was pretty level. Check-in was unimpressive. When we got to our gravel site...all of the hookups were covered in fire ants so hookup and disconnection was unpleasant. Otherwise quiet and easy access to I-20. Made reservation weeks ago....arrived NO RESERVATION...never received e-mail,,their comment "WE ONLY EMAIL IF YOU REQUEST IT." Have stayed there several times this one takes the cake,, They found me a site ..PIKES PEAK..you can't use a surge protector there will not open because the voltage drops. I will not stay there again..They are not keeping up the park.. This is a no-frills RV park. The roads are gravel and there is plenty of room for big rigs to maneuver. It is conveniently located close to the highway and across the street from a truck stop, which is nice after a long day's drive. We had no problem finding our site and leveling up. There was quite a bit of road noise, but once we cranked up our A/C, we didn't notice it. This is a good choice for an overnight stay but I would not want to stay for more than one night. This Park was easily accessed from the Interstate. Once we were hooked up, it felt like we were miles away from everything. It was super quiet. The Owner/Staff was incredible nice and seemed to genuinely care that all was as good as it could be for us. The Park is clean, the site was a pull through, very level and next to a fish pond. There were Grandparents traveling with children who were parked next to us - very closely next to us; the closeness being my only complaint. But once we went inside, there was NO noise. The pool, grass, "club house," were meticulously clean. I didn't use the restrooms, so I can't rate them. (I would think they too would be spotless judging from the rest of the place.) I would stay there again - and I would bring my Grandchildren! This was a two night rest stop for us, so we appreciated the easy on/off to the hwy. Most of the sites are pull through, with all being packed gravel. Our site 49, was fairly level, and not too noisy from the hwy & Love's truck stop noise (across street). The $36 rate was nice, as was the cable and wifi. The WiFi supported streaming which was great. There seemed to be quite a few long term residents. Everyone was very friendly. The grass was a little long but they were cutting it as we left. The owners are extremely cordial and helpful. Most sites are shaded with well-manicured lawns. We stay there annually. The bathrooms/showers are spacious and unbelievably clean. This was just an overnight stay for us, so appreciated the easy on/off to the hwy. Most of the sites are pull through, with all being packed gravel. Our site 49, was fairly level, and not too noisy from the hwy & Love's truck stop noise (across street). The $36 rate was nice, as was the cable and wifi. The bathrooms are very nice and clean! Individual shower stalls that lock. I had to peek at the laundry room after seeing the awesome bathrooms, and it was great too! This campground is a delightful surprise after driving for two days across Texas. New office and community room. Great showers and laundry. Very well maintained surrounded by mesquite trees. Office and maintenance staff are very responsive. Liked it so much we increased our stay to three days. Only marked it down a little because of proximity to the highway noise. The park is located right of the highway and accross the street from a Love's Truck Stop. 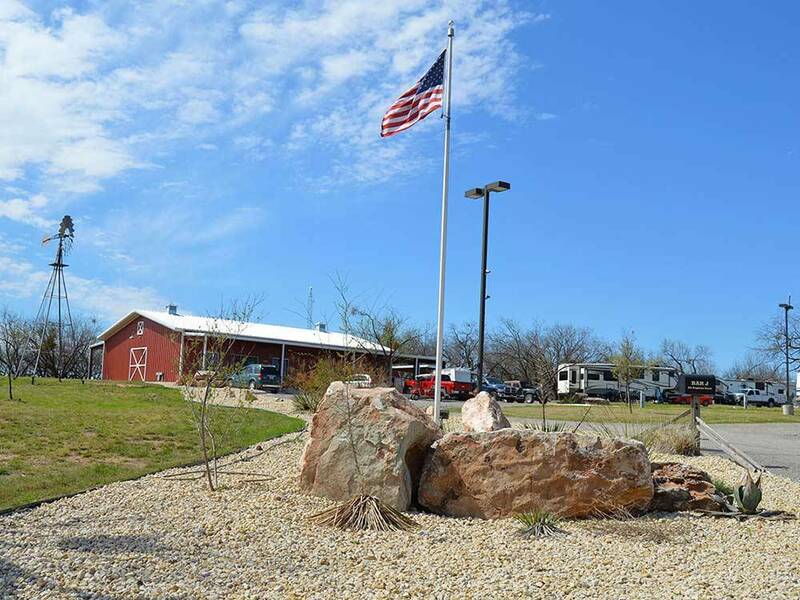 The RV Park appears well maintained with green sculptured grass and level gravel sites. The staff was very friendly and the restrooms and facilities were immaculate. Reviews of the Park complained of noise from the truck stop and the business located next door, however we were not bothered by any noise. There is a large wall separating the business, which might account for the lack of noise coming from it. In our opinion the truck stop could not be heard. The only noise came from trucks entering the highyway, and that was few and far between. Overall this is a well maintained RV Park. The only complaint I could offer would be signage is hard to see as you approach where to turn to get into the park. We would definatly stay again. We stayed one night but were impressed with the quality of the campground. The pull through spot was easy to access and clean. The manager was friendly and came out to check on us after we hooked up to see if there was anything we needed. Although the park was just off the highway, there was no problem with noise as the owners had planted trees and bushes as sound barriers. The spaces were not too close and we had more than adequate room. The bathrooms we were unbelievably clean and easily accessible. We were impressed with the area open to campers to visit or watch TV or play games. The manager couldn't have been nicer and we will definitely stay again on our travels. I highly recommend this campground for a one night stay - or longer! 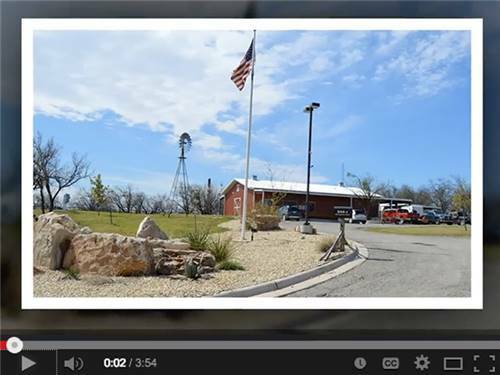 This RV park is clean and very well organized with friendly office personnel. However, you will not get a good nights sleep. The park is located next to the interstate and a Loves truck stop. So you will hear big rigs constantly, This is compounded by trains at all hours and a nearby airport who's runway is oriented so planes land and take off over the park depending on the wind direction. We finally gave up and left at 4AM. The restrooms, showers and laundry facility were brand new and beautiful! The woman who checked us in couldn't have been nicer or more helpful. I would go to this area again just to stay in that park! About 400 yards NORTH of I-20. Very clean and well laid out. Spent 1 night and would stay again. The owner is extremely nice. This is the best camp grounds in area. Very clean, ,lots of space and owners are really friendly and hepful. Activities include a carnival, parade, awards, gun & coin show. Sweetwater is also home of the WASP Museum, the Pioneer Museum, and Lake Sweetwater. 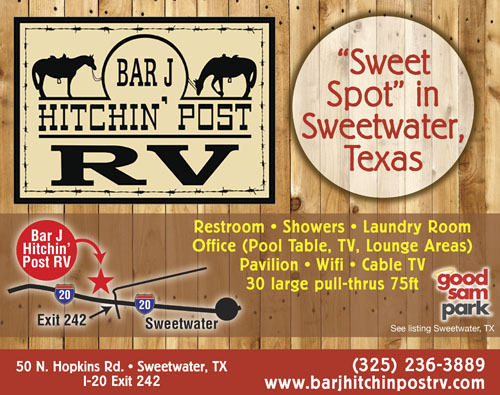 No better place to stay than Bar J Hitchin Post RV.